Here's another unusual entryâ€”Frisell's titular group from 1996's Quartet, but here expanded to a quintet with the addition of Don Byron, who'd been a regular Frisell partner since the guitarist's Have a Little Faith (Elektra/Nonesuch, 1993) and the clarinetist's own milestone, Tuskegee Experiments (Elektra/Nonesuch, 1992). Quartet represented a significant stylistic shift for Frisell; with the dissolution of his longstanding trio with Kermit Drisoll and Joey Baron, the guitarist decided, at least for a time, not to try and replace the format; instead, opting for a rhythm section-less group with Eyvind Kang, trombonist Curtis Fowlkes and cornetist Ron Miles. 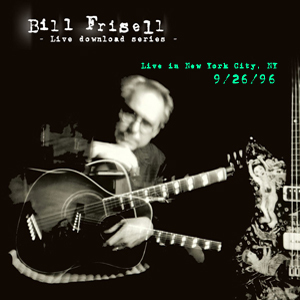 Unlike #006, which presented an album tour that culled most of its materialfrom the album, here Frisell's Quartet+1 only covers four songs from the album,looking to other sources, including a skewed New Orleans-centric version of "TheRain in Spain," from the hit 1956 Broadway musical My Fair Lady, with Byron'sbass clarinet soaring across its full register; a curious version of Rambler's "StrangeMeeting," where Byron's bass clarinet acts as both bass line and rhythmic anchor;and an early version of Nashville's "We're Not From Around Here" that, again,proves the inherent flexibility of Frisell's writing to fit into any context,whether it's the brass-heavy version here or the more bluegrass-informed takeon the studio album from the following year.